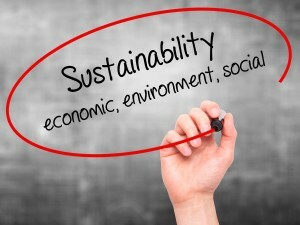 Corporate sustainability is an approach employed by many modern businesses to create company value through greener strategies. These are aimed towards the long-term, and they focus on balancing the surrounding social, economic and cultural environment with the company’s financial growth. Through corporate sustainability, the business focuses on establishing a culture that provides transparency to both employees and customers, resulting in effective development where those involved may take pride in how the company develops. One of the largest factors that prevent companies from immediately adopting corporate sustainability practices is the fact that results are difficult to exactly quantify. Studies show that though exact figures may vary, effective sustainability practices can result in increases in revenue, reduced long-term energy expenses and reduced material and waste expenses. The right sustainability practices may also attract more driven individuals as employees and consumers, resulting in improved practices and potential tax break options. The concept of professional transparency is designed to encourage business leaders to establish an open and engaging environment around their company. The scope of such an environment depends largely on the company’s practices, and it is not uncommon for some business owners to include the entire community. Studies show that increases in transparency improve company performance and increase overall profits. The culture of transparency helps involve more employees in the creative process, resulting in a better utilization of individual merits while simultaneously driving the company’s product and service development forward. All companies that implement corporate sustainability strive to focus on the future as well as the present. Factors such as projected environmental waste and material waste factor into the company’s planning and decisions. With such aspects in mind, many companies invest in recycling practices that ultimately end up saving them significant figures on their expenses. Proper recycling techniques and maintenance procedures help reduce waste materials, which saves the company a small fortune in processing fees and time spent dealing with potential problems. USI believes in partnering with our commercial builders and General Contractors to develop the best energy solutions for sustainable buildings and to reduce long-term energy expenses. For more information about installed insulation for commercial projects, include thermal barrier and fire stopping, contact USI online to find a branch near you and get a free quote. USI believes in excellence in every step of the process and ensures timely completion and quality of service, time after time. ← Why do builders hire architects?